Many Soon after the Mohawks broke the peace with the French and Algonkins in Canada, and in 1647 killed Piskaret the champion, they and the others of the Five Nations drove the Hurons and Algonkins into flight. The Hurons, styled in English Wyandots, fled clear into Michigan and spread down into northern Ohio. Having talked with Major Rogers, Pontiac sent runners to notify the villages that the English had his permission to march through the country. He himself went on with the party. He astonished the major by his shrewd questions�as to how the English waged war, how their clothing was made, how they got iron from the ground, for their weapons. Vague rumors brought in by traders and friendly scouts floated hither-thither�rumors of mysterious remarks, of secret councils, of a collecting of arms and powder, and a sharpening of knives and hatchets, even among tribes remote from the posts. In the midst of the forest he addressed them. 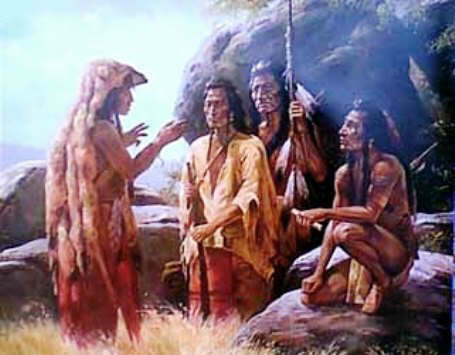 Here, seated in a large circle, were Ottawas, Ojibwas, Sacs, Potawatomis, Wyandots, Senecas, Miamis, Shawnees, Foxes, Delawares, Menominis�all intent for the words of Pontiac. His speech was full of fire and eloquence. He was an orator. He reminded his brothers of their treatment by the English, and of their better treatment by the French�their friends who had been ousted. He told them that now was the time to rise, when the war canoes of their French father were on the way to re-people the land with happiness. Let the Indians return to the customs of their ancestors�fling away the blankets, the coats, the guns, the fire-water, and use again the skins, the bows, and the native foods, and be independent. "As for these English, these dogs dressed in red, drive them from your hunting grounds; drive them! And then when you are in distress, I will help you." The day was named by Pontiac. It should date from the change of the moon, in the next month (or about May 7). At that time should begin the work, by all the tribes, of seizing every English fort and trading post in the Great Lakes country and west of the Alleghany Mountains. The tribes nearest to each should attend to the matter�strike when they heard that he had struck Detroit.